Would you like to hear about the bright idea that *didn't* make it onto the blog this week? 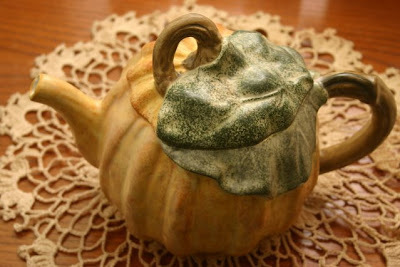 It is this: I was going to carve a simple teapot shape into my pumpkin, plop a tealight inside, photograph it at night, and inspire tea lovers everywhere with what a tea lover's jack o'lantern ought to look like. Alas, I could not find a nice round pumpkin with a pretty stem attached (and I inspected lots of them), so I decided I'd do without rather than show you an ugly pumpkin. Fortunately, my sweet mom found me a pumpkin teapot on one of her yard sale jaunts last week, so I am not pumpkinless today after all. I am also not tea-less today. 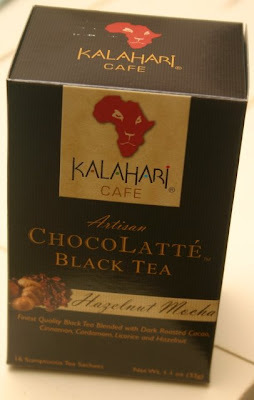 I was walking down the tea and coffee aisle at Publix earlier this week (pure habit), and I hit the brakes when I saw an elegant looking black package with some new Kalahari Cafe tea, a brand I'd never seen or sipped before. The varieties all looked so decadent I had a hard time deciding on one of these Chocolatte tea varieties, but I finally decided I could wait on the Raspberry Truffle and got the Hazelnut Mocha instead. It was an excellent choice. Talk about a dessert tea! If you read the ingredient panel, you see "Dark Roasted Cacao" listed just before "Organic Black Tea." This tea also contains cinnamon, licorice (which I didn't detect), chicory, cardamom, ginger, cloves and natural hazelnut flavor. The taste is wonderful, and interestingly enough, it is manufactured by Kalahari USA in Atlanta, just up the road from me. I easily get two steepings from a single teabag, so if you're looking for a nice chocolate flavored black tea, I highly recommend this one. It's going to go quite well with all that candy my workplace is going to be giving away today! Normally, I wouldn't be buying a "Holiday Tea" in October, but normally, I wouldn't have just read that this tea can be hard to find, and thus been all antsy that I might not be able to find said tea around the holidays. 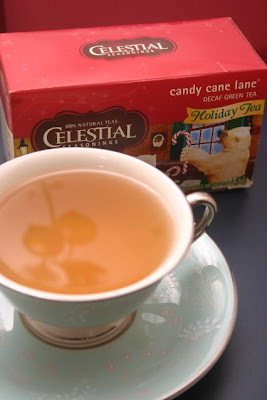 A review I read recently had me hankering for some of Celestial Seasonings' Candy Cane Lane tea (or "candy cane lane," since for some reason they aren't into capitalization over at CS). 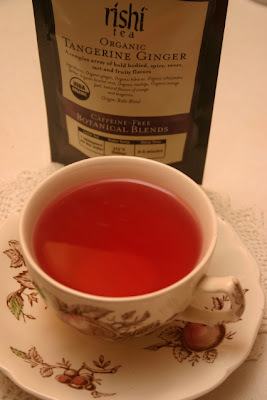 The reviewer talked about stocking up on this tea, which is a decaffeinated green tea, for one of her kids. What most intrigued me was that she said you couldn't tell from tasting it that this is a green tea at all. Well, I'm always eager to find a tastier green tea, not being a huge fan of green tea's grassy taste, so I tried a box of this tea this week, and I have to say it is great! This is my new favorite settling-in-for-the-evening tea, and the fact it's decaffeinated makes it perfect for late night sipping. So please forgive me for rushing the holidays, but I just wanted to be sure that you, like me, know to look for this tea *early* if you are so inclined! It's amazing how much more hot tea I'm consuming now that the weather has turned chilly. (And as my DH and the electric company would tell you, I'm someone who finds anything under 80 degrees to be cold, so temps in the fifties and sixties mean it's practically freezing to me!) This weekend at Marshall's I picked up two new boxes of teabags to try, and I really enjoyed both of them. 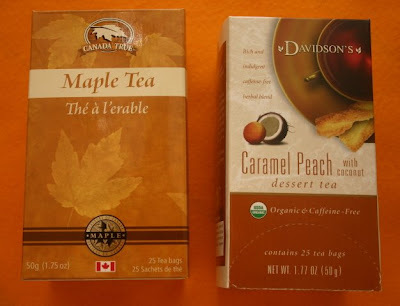 The Maple Tea from Canada True took a couple of tries before I got it to my liking. The first full steeping of 5 minutes resulted in tea that was too strong and a bit bitter, but I tried it again steeped at three minutes and with a little sweetener and thought it was just right. My favorite was this Caramel Peach Dessert Tea from Davidson's Teas, but then I have yet to try one of their dessert teas I did not like. The Davidson's tea was tasty and plenty sweet on its own, so I drunk it with no sweetener added and was quite satisfied. With these long evenings spent indoors, I'm starting to pull out some sewing projects and think about Christmas gifts. One night last week, I sewed this really simple Christmas Ball ornament that's going to be in the upcoming issue of the magazine. But just as I did all last fall and winter, I found myself sticking straight pins and needles in the arm of the sofa since I didn't have a pincushion on my end table. That first Christmas ball came out so nicely, on the way home from visiting my parents this weekend I stopped by Hobby Lobby in Carrollton for more supplies. I always make a point of visiting their clearance displays, and look what I found with a nice markdown! If there's anything I like better than finding sewing supplies on sale, it's finding sewing supplies on sale that have a tea connection! A month ago, I passed up this little teapot and water pot set that was on clearance for just $5 at a Marshall's in Marietta. Ever since I went to England and had my tea served in one of these sets, freshening the spent tea leaves with the hot water in the companion pot, I'd thought I'd like to have one of these sets. The only sets I found were vintage ones by Hall, and usually they were $100+ on eBay but they just weren't very pretty. I'd seen a photo in a book of a vintage pink set I liked, so I put that on my "someday" wish list. So because it wasn't vintage, I left this set at Marshall's last month. Besides, I'm nearly out of room for new teawares and have to *really* be selective about adding new pieces that take up space. But then I got home, of course, and thought, "Was I mad? 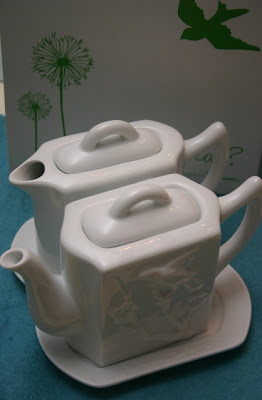 A $5 teapot and water pot set, and I didn't get it?" I can always seem to stack a few more things into those cabinets in the garage, or even give something away if storage space is that tight. So when my mom and I went back to that same Marshall's store over the weekend, I assumed there was little chance the $5 boxed set would still be there. It was, and all the clearance items were an additional 25 percent off, so I got it for just $3.75. I'd still love to have one of those old Hall sets one day, but sometimes it makes sense to "settle" for something else in the meanwhile. I'm glad I did! Do you know your tea history? 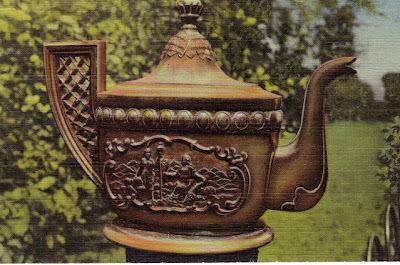 This vintage postcard depicts a teapot on display in a certain town in North Carolina. Tomorrow, Oct. 25, is the anniversary of an important date in American tea history, and it happened in this town in North Carolina. Whew! We are just a few hours away from putting the Nov/Dec issue of the magazine to bed, and I'm about ready to put *me* to bed as well. It's been a day, beginning with the discovery that last night's Ginger Pear Tea Bread that was to be the subject of this morning's post was a soggy, didn't-cook-all-the-way-through mess. (Please tell me you have those kinds of things happen.) If I ever perfect the recipe, I'll share. 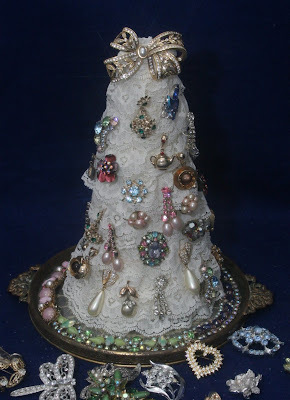 Until then, I wanted to tell you (especially those of you not in our readership area) about my latest craft idea, this Jeweled Lace Christmas Tree. Readers will find out in their Nov/Dec issue (or, if they're tea blog readers, right now) that Deberah, the art director, and I are going to do an online "Twelve Days of Christmas" event this year beginning Dec. 1. We've already been working on some of the projects we'll be sharing, and my idea was about as simple as it gets: Cover a white Styrofoam cone with lace (I used little quilting pins to fasten the lace) and then clip or pin old costume jewelry to it! Now *I* liked it, but when I got through I wondered if others would think this was just about the tackiest thing they'd ever seen. I pulled it out at work for its photo shoot, and to my absolute delight several of my co-workers (heck, even the publisher!) said they liked it. Groovy! Anyway, that's really all there is to it. 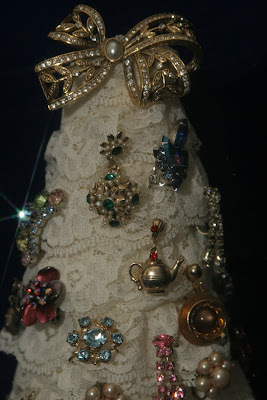 I just had to point out to my tea friends that there are teapot and teacup earrings on my tree (and only YOU would probably have ever noticed that anyway; doubleclick if you want to see more detail). There's the teapot earring with the ruby colored stones, and then below it is a golden teacup (it's hanging sideways) with an amber colored stone in the center representing the tea. Fun! 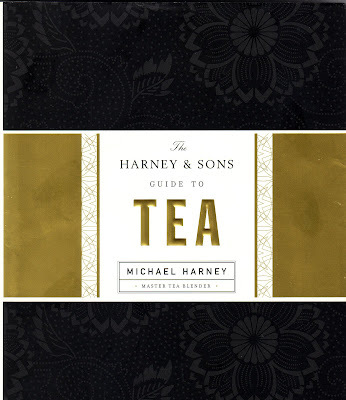 "The Harney & Sons Guide to Tea"
Last week I received a copy of "The Harney & Sons Guide to Tea" by Michael Harney with Emily Kaiser, and as I expected this book is definitely a *must* for the tea lover's library. With 20 years experience buying and blending tea for his family's firm, Harney is definitely someone whose tea expertise can be trusted. So when his book lists "the 56 teas every tea connoisseur ought to know," well then, I simply assume there will be 56 teas I ought to know! What's the first tea in the book? Yin Zhen, or Silver Needles. Hey, I tried that tea not long ago and really enjoyed it! So far, so good. Next up: Bai Mei, or White Eyebrow. I once tried a tea named Precious Eyebrow. Is this the same? Must investigate. Actually, I'd really like to investigate all these teas, and I'll bet I'm not the only one reading through this delightful book who thinks so. So, I have an idea. Michael Harney recommends these 56 teas. That means if you tried just one a week, and doubled up near the end, you could try all 56 in one year. What do you think? Is that realistic? While my tea budget isn't quite prepared to support a full tin of tea every week, I do think I might be interested in ordering 4-8 samples at a time. Now I'm not officially committing to this, yet, but I'd love to know if others who have this book (or plan to get a copy) might be interested in critiquing these 56 teas during 2009. Maybe on Monday of each week I could list the tea up for review, and then on Saturday anyone who likes could post their opinion. Maybe even call it "Tea Tasting Saturday" or something like that. Would you participate? Maybe not every week (although that'd be great! ), but at least some? Would you? And if you think it's just not a very interesting idea, please say so (you can even say it anonymously, you know). As an editor, I can promise you I've had some real dud ideas before, and I'd rather this not be one of them! I don't know what the packaging will look like, but I think you'll all be intrigued by the idea behind the Presidential Teas shown here. (See the Oct. 15 and 17 posts.) 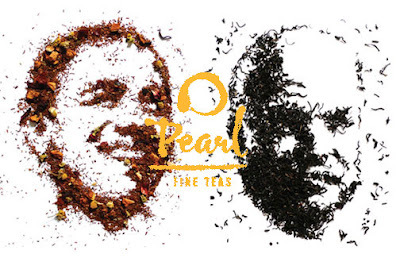 You really must see this, especially if you're a tea-loving political junkie like I am! I first tried the cranberry marmalade on toast as an afternoon snack, and I loved both the tangy cranberry plus the zip from the orange peel and the ginger. And this is a minor point, but as a crafter who sometimes saves jars for buttons and such, I like the shape of these glass jars as well. I also feel like I "know" Marilyn since we've "met" here in blogland, and her customer service is awesome. Can't say that about just everybody, you know. If you're also a fan of ginger, as I am, then you might like a new herbal tea I found last week at Whole Foods, Rishi Tea's Organic Tangerine Ginger. Open the bag and go "ahh," because you'll swear some tiny tea lover just peeled a tangerine right there inside the bag. 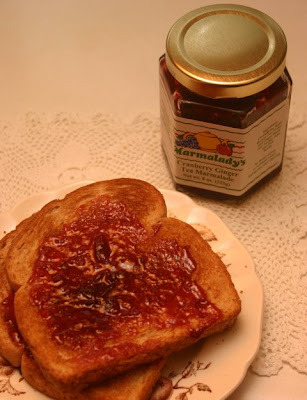 Enjoy this tea with toast spread with some of Marmalady's famous marmalade, and you have the perfect fall breakfast or snack. Mmmm! A better woman would have knitted that swatch so the new knitted mug cozy she worked on over the weekend would turn out right, and she could thus share a photo of it with her dear friends in Blogland. Well, guess what? Instead, we are simply going to share the new magazine that contains the pattern. As a bit of a newbie knitter, I was familiar with the name of designer Debbie Bliss. 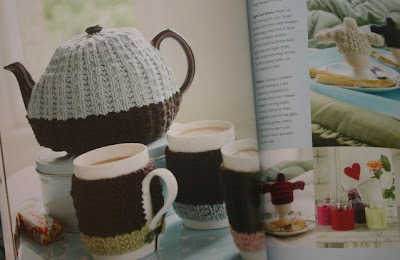 When I saw there's a new knitting magazine bearing her name, I flipped through it and came across this lovely set of tea cozies for teapots and tea mugs. Don't miss the adorable sweater-shaped egg cup cozies at right. If I were a more advanced knitter I would definitely try those. As it is, I think I'll just work on selecting the right yarn and working that swatch next time. Meanwhile, this issue is on newsstands NOW, so tea-loving knitters, be advised. I should have tried the crochet project I had on hand instead. 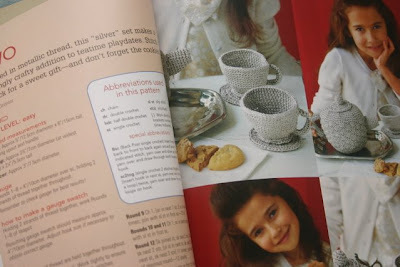 Thanks to reader Gerri, I learned the Nov/Dec 2008 issue of Crochet Today has a pattern for this tea set for a child, crocheted in metallic silver thread. 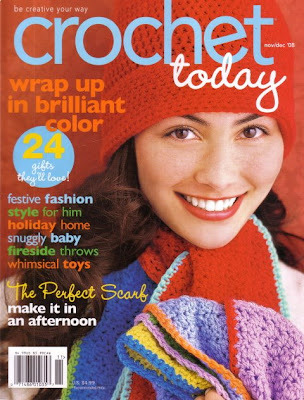 I wanted to crochet this before I blogged about it, but over the weekend I realized that if I wait until then, the magazine will probably have disappeared from the newsstand. So, my fellow crocheters, get those hooks and yarns ready for teatime! Checking out with my small stack of tea loot the other day, I sat my purse down next to a display of tins of Tea Lover's Chocolates and held one up, debating. "I think I need this," I said, and when I showed it to my niece Cari and she agreed, I added it to my stack. Something about this name sounds familiar. Perhaps these "55% cocoa dark chocolate drops best paired with black teas" have been advertised in the tea magazines? They're made by the San Francisco Chocolate Factory, and I love-love-love the design of this tin. If it were an inch or two longer, it would be about the size of the classic children's paint set. While the $3.99 tin of chocolates is certainly pretty, I must confess I was expecting something rather semi-exotic and wonderful, but these taste exactly like plain old semi-sweet chocolate chips to me. So although I was disappointed in the rather ordinary taste, I'm going to save these for baking and I'll put the cute tin to use for storing craft supplies. When I come across new tea infusers it's hard for me to resist trying them just once, but this one was intriguing because I've never seen a "plunger" style tea infuser with a mesh style basket, and this basket is roomy enough to actually give tea leaves room to swim around. Norpro (whose Tea-Stix I recently tried) is the maker of this infuser, which I found at HomeGoods, and it is the best one I've tried all year. After all the iced tea of the summer, I'm starting to drink more hot tea again, and to avoid having to buy paper filters all the time I'm taking a new look at my infuser collection. 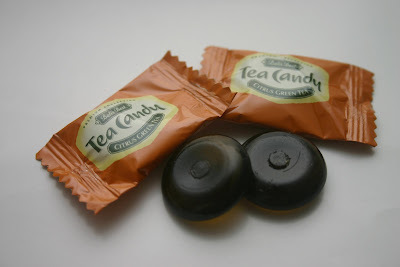 Bali's Best Tea Candy has another flavor. I discovered this brand back in July at World Market and tried the Classic Iced Tea and Green Tea Latte candy flavors. Both were pretty good, and for just $2 a bag it was a great price. 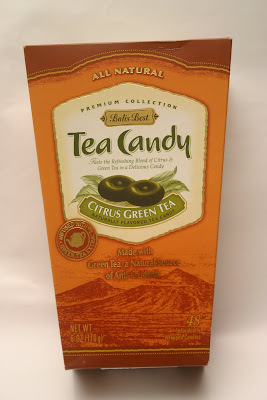 I have since found that HomeGoods carries these pretty boxes of the Citrus Green Tea Candy ($2.99), which I think might make a nice little gift for tea friends. This sage green candy very much reminds me of tea with honey and lemon. The "honey" note is much greater than the "citrus" note, in my opinion, but I like it a lot, perhaps more than the other two Bali's Best candy flavors I've tried. 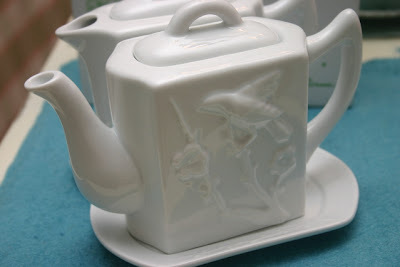 There are few objets d'art in the tea world that I've looked for at a discount and, between friends, family and regular visits to T.J. Maxx, haven't been able to find. 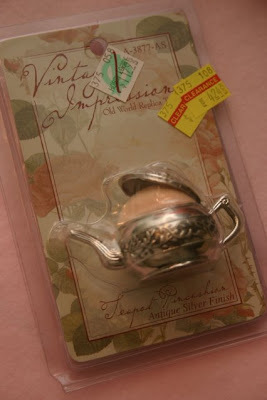 But one item has been on my list for years: a teapot-shaped glass paperweight. I've seen them pretty regularly in catalogs for $25-30, and even though I suppose I could have had one by now, I just thought that was too much for a paperweight. Homegoods (part of the T.J. Maxx family) has come through once again. 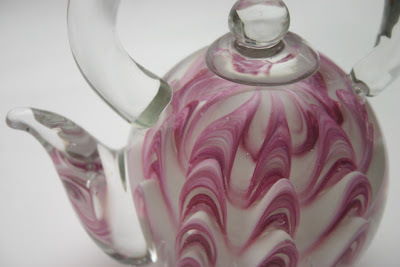 When we were there this weekend, I spotted a red and white striped glass paperweight in the shape of a teapot. How much? $5.99, which I by now realized was a fantastic price. Only problem? I just don't much care for red and white stripes on an everyday basis. Then in another location in the store, I found a black and white striped one. Hmmm, were there more? Indeed yes. 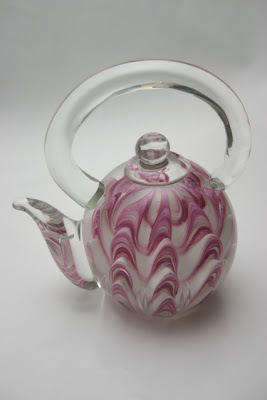 So now I'm the happy owner of a rose colored teapot paperweight which I will use at work to waylay all those notes and bits of paper that inevitably pile up, especially the closer I get to deadline. I'm so glad I finally found this at such a good price, and in case it's been on *your* wish list as well, I thought this might be worth sharing! When my mother, aunt and I went shopping on Saturday, my 9-year-old niece Cari joined us. Her older sister was at an all-day ball tournament, and her little sister was at the ballgames too, so Cari was nearby as I was perusing the teas and treats at the Homegoods store near Town Center. Cari pointed to some candy corn and said, "I LOVE candy corn!" I didn't know that, but I love candy corn too, and when I saw some S'MORES flavored candy corn, I had to get it for us to try. As we sat in the car waiting for mom to load up some new lamps, I told Cari of discovering some caramel apple flavored candy corn and learned we both like the flavor of caramel even better than chocolate. So even though I was sorry I didn't get to see my other two nieces on Saturday (or my sister, I should add! ), it was fun to learn that Cari and I both like caramel and candy corn. Next we went to a Ross store, and I was mighty tempted to buy a tin packed with Caramel Apple Cookie Mix with caramel icing. The problem with a mix, though, is that if you make the cookies and really like them, you can't simply go make them again because they're from a mix, not a recipe. 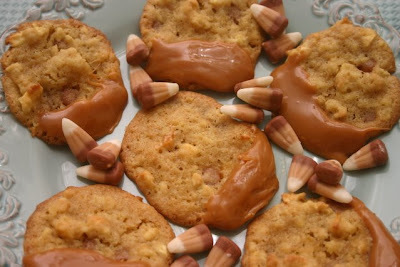 So, I decided right then and there to invent my own recipe for Caramel Apple Cookies. What would such a recipe require? Apples, of course, and dried ones seemed a better choice than fresh. As I shopped for groceries I was looking for dried apples along the baking aisle, and I had a "Eureka" moment when I discovered a package of caramel BITS. No more unwrapping all those teeny little plastic wrappers? This is brilliant! Basically, my recipe is a converted chocolate chip cookie recipe, but I very much like how these turned out all nice and chewy. 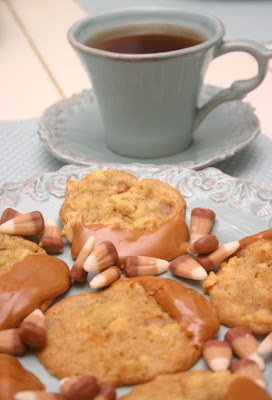 And they are GREAT with a nice steaming cup of caramel tea. A perfect fall combination! I've really been getting some use out of that teapot punch lately. My cardmaking skills are very, very basic, so I'm not really experienced enough to do some of the more magnificent cards you see. But simple works well for me, at least for now, and I liked this little notecard enough to use some rose-colored velvet ric rac I'd been saving. I do love the ric rac! If you really want to see some gorgeous handmade cards, have I got a gal for you. I discovered this talented lady's blog a while back and am just amazed by her cards! They are by far the prettiest, most elaborate, most perfect ones I have ever seen. The one she did Wednesday has coffee cups, but I think that design could probably be used on a teacup card, too. I'm treating this blog as my own personal "tutorial," so maybe some of you will enjoy her "class" as well! • Something with a pink rose hot-glued on it and labeled "Shabby Chic"
Do I sound cranky? I'm really not, it's just that I'm suffering from a bit of "inspiration deprivation." A decorator friend of mine once told me it's a fact that our decorating tastes change every certain number of years or so. 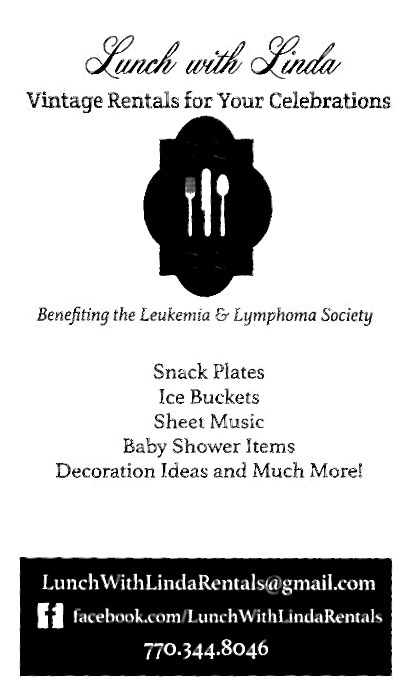 I can't remember the number, but I must be there, because suddenly I'm hankering to redecorate, to make some new crafts, and yet I've been so terribly uninspired. Even some of the nationally-famous decorating blogs I've been visiting are starting to all look the same. I don't want to see one more vintage postcard slapped on a background of old sheet music. Somebody, PLEASE come up with something new! And that's where the wonderful art of tea dying comes in. 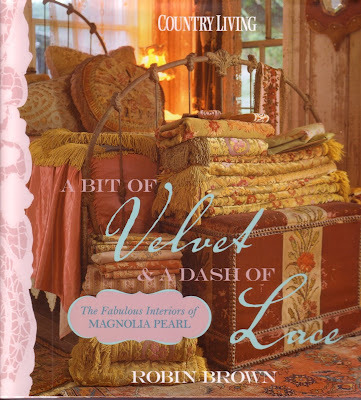 The other day, I received a review copy of Robin Brown's wonderful new book, A Bit of Velvet & A Dash of Lace. Looking through the glorious, lush photos, I came across a photo I distinctly remember seeing before, of old laces, dyed in tea and drying on a clothesline. This appeared in Country Living magazine a while back, and I was charmed. Then, I came across the Autumn issue of Somerset Life, my most treasured crafting (and lifestyle) magazine. 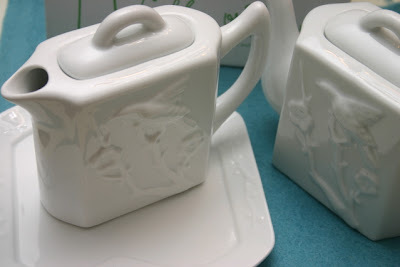 I was instantly smitten with some images I saw up front, and delighted to realize they were pieces crafted by tea lover friend Connie Govea Stuart. I e-mailed Connie to tell her how much I enjoyed seeing her new work, and she said the paper doll/dress looking piece was made of a tea dyed coffee filter! Inspiration, at last! I don't know what I'm going to do with all this tea dyed lace I'm working up, but I can promise you this: It will not be wound into a ball or dropped into a glass jar! You know that old saying about having friends in high places? Well, I recently learned that a friend and former colleague is in "high places" in the tea world! Flynn was -- gosh, this makes me sound old -- one of my first Teen Board members when I was the newspaper's lifestyle editor. We looked for young people who were interested in reporting for our Teen Page in the newspaper, and from the day she applied Flynn was always a standout. After she graduated from high school and college, she was hired to join our staff and became the business editor. After a few years of real world experience at the paper, Flynn got accepted to NYU and moved to the Big Apple. She graduated this year with her MBA, and guess who is now an associate brand manager with Unilever and working on the Lipton powdered tea brand? When she e-mailed with the news recently, expecting I would be pleased to hear of the Lipton connection, I immediately wrote back to let her know I'm thrilled at her new job because I'm quite a happy Lipton Tea to Go customer. 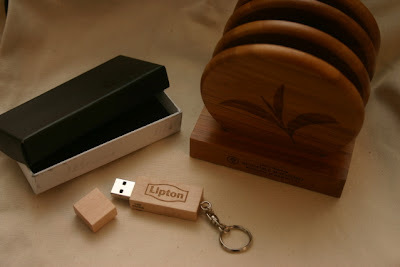 But there was more: A Lipton flash drive. 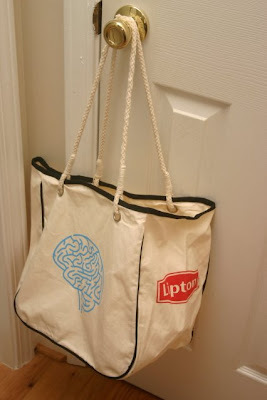 A Lipton towel. 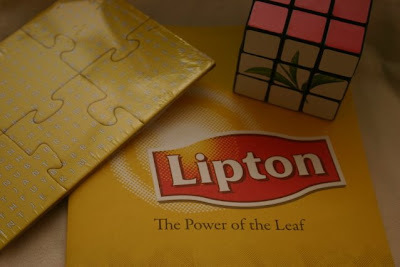 Lipton coasters and puzzle and ... a Rubik's cube. Can you imagine how positively giddy I was as I opened each item? There was a nice promotional booklet that showed some of the newest Lipton products, many of which I've already tried, such as my beloved Green Tea with Mandarin and Mango. But I was pleased to see there's also a new flavor to look for, Raspberry Lime. Flynn sounded quite excited about some of the new projects in the works for this line (there's a big push on the green tea, she says), and I am so completedly tickled that I have a friend who is actually working in the tea world! Rest assured, dear readers, that if Flynn lets me in on any big tea news, you'll be reading it here. I can't wait! 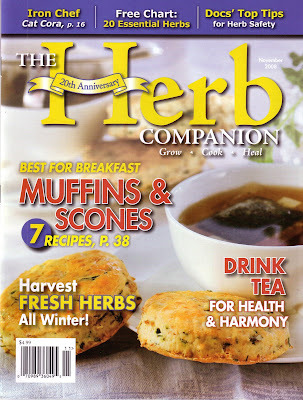 The new Herb Companion magazine! For today's post, we must thank the inimitable ParTea Lady, whose tip yesterday led me to search for the November issue of Herb Companion at the grocery store (Lower Fayetteville Road Publix, FWIW). She had advised that this special 20th anniversary issue of the magazine celebrates tea, and indeed it does! This issue is simply jam-packed with articles about tea, recipes for teatime, and even advertisements from new tea vendors. 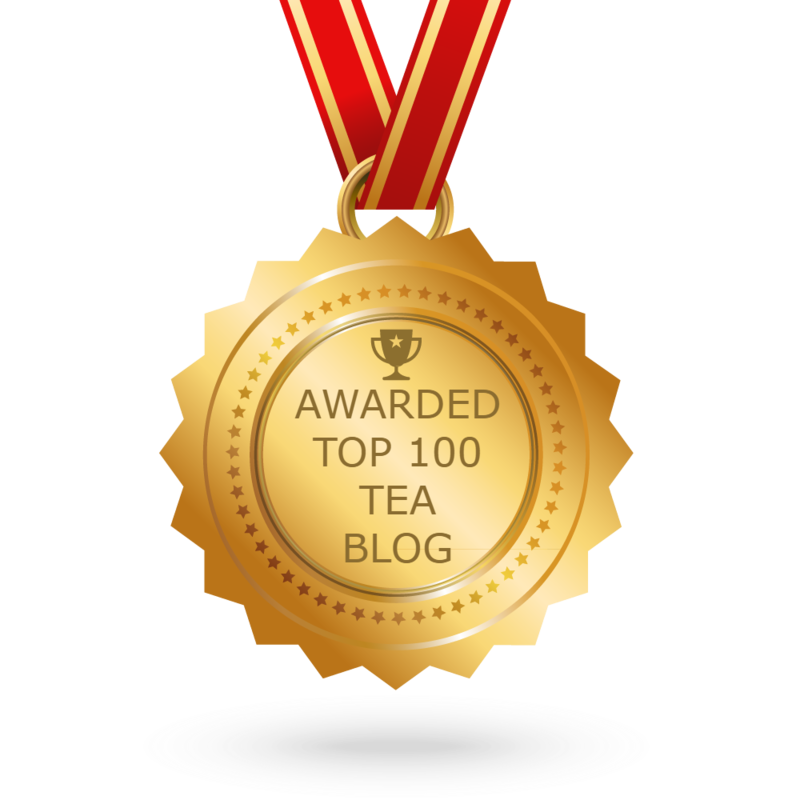 I counted at least 10 articles on tea, and they're accompanied by graphics, sidebars, recipes, a tea timeline and more. I can't wait to try some of the recipes (Whole-Grain Scones and Buckwheat Apple Pancakes sound especially good), but there are also "recipes" for beauty treatments, including an English Tea Astringent and Green Tea Skin Soother. I like herbs and have bought several issues of Herb Companion over the years, but this wonderful issue is definitely a keeper! 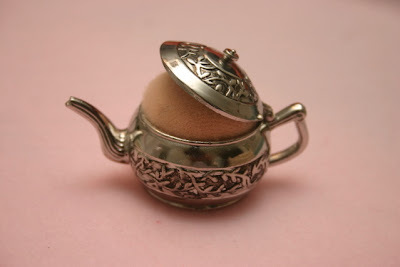 OK, I almost never stay up past midnight anymore, but I'm still wired and just watched Jay Leno do his "Headlines" segment, and one of the newspaper headlines was about someone nicknamed Scissorhands who does/did a teapot topiary. I don't know if this is the same one he referenced, but googling led to this link. I want one of these! Don't you love it when a book that's been on your wish list for some time suddenly shows up at an antique mall? 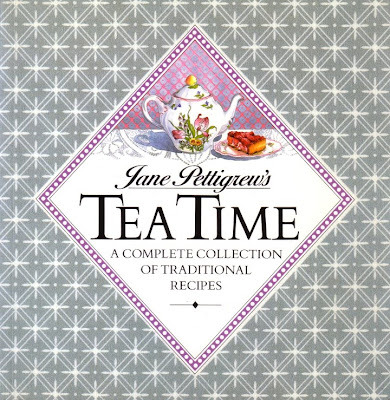 Such was the case with "Jane Pettigrew's Tea Time," of which I found a 1992 reprint in excellent condition at Newnan Antique Mall on Friday. It was just sitting there, on top of a stack of cookbooks, tilted ever so slightly as if someone wanted to make sure I didn't miss it. Since I was already a fan of Miss (Mrs.?) Pettigrew, whom I had the pleasure of meeting at the World Tea Expo last year, I was especially happy to take this home with me. When making the Shrewsbury Biscuits, I first had to "Americanize" the recipe by figuring out the equivalents for some of the ingredients, but the recipe was so simple this was quite easy to do. The instructions also said to cut out these cookies with a three-inch cutter, but after doing so several times, I decided it was easier to simply roll these into a ball and flatten by hand. So here's my version of the recipe in case you'd like to try them yourself. I enjoyed mine with Earl Grey Tea, and they were simply delicious! "The girls and I eat off fine bona china," she said, and she even travels with her own tea service. The Duchess had an assistant bring out her oversized, "eccentric, completely mad tea set" for the audience to admire. Made for her by Asprey, the elegant, dome-shaped trunk housed a Wedgwood teapot and accoutrements. The teapot happened to be a wedding gift from Wedgwood to her and Prince Andrew, whom she married in 1986 and divorced a decade later. The pot was designed with a no-drip spout and is a favorite piece. "So when you pour the tea, it doesn't dribble," she said. In the bottom of the trunk is storage space for a metal bottle to keep water hot, an Irish linen napkin, and an Inverness tartan plaid "rug," or blanket. The Duchess noted that another of her titles is "Countess of Inverness." Her traveling tea trunk also contained some Twinings tea ("I like Earl Grey") and even a package of shortbread cookies, "because on Weight Watchers you can have shortbread," she said. Something else in the story that I'd forgotten was that Sarah told everyone bone china is not as fragile as people think it is, and to illustrate her point she had a man come on stage and stand on top of two Wedgwood teacups, both of which came out just fine! Sarah Ferguson, the Duchess of York, was on the Today Show earlier this week promoting her new children's book, "Tea for Ruby." I bought a copy at Scott's Bookstore yesterday, and I must say, the new book is simply charming! But then I'm a fan of any book that's designed to promote good manners. The book is illustrated by Robin Preiss Glasser, who has also illustrated patriotic books for children by Lynne Cheney, wife of the vice president. 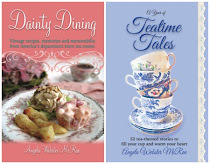 In "Tea For Ruby," our heroine is invited to tea with the Queen and is so excited she runs all over town blabbing the news, loudly and somewhat rudely, to everyone she meets. I fear that would be me if *I* were ever invited to take tea with the Queen! 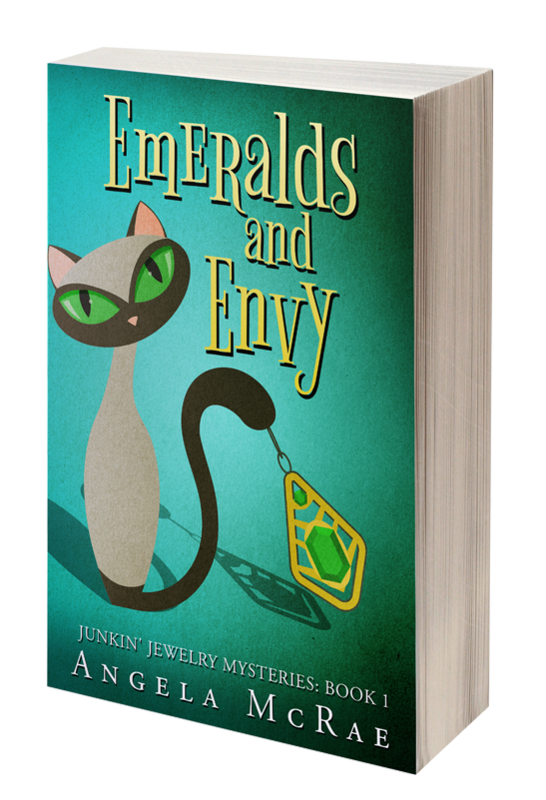 But Ruby intends to set her party manners in order by the time she arrives for tea with the Queen, and since there is a bit of a "plot twist" to the book, that's all I'm going to say about THAT. 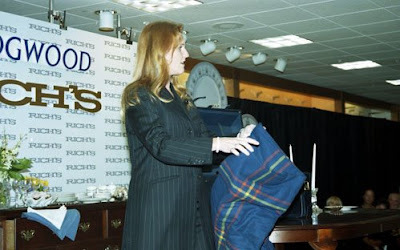 One thing Sarah Ferguson talked about in her Today Show interview that I found interesting was how she has tried to instill friendliness and people skills in her own daughters. Good for her! I have long been a fan of the Duchess, and don't you get the feeling you would really enjoy taking tea with her? May I just confess that one of my fondest dreams is that she and the Prince will get back together? I mean, please ... they get along so well. Why not? Later today, if my colleagues in the photography department have time to help, I'll try to post some photos of Sarah when she visited Atlanta some years ago. She was speaking on behalf of Wedgwood, and I most remember the specially-designed case containing her traveling tea set. I think you'd enjoy seeing it, so check back in if you're inclined to like that sort of thing! Yesterday it occurred to me that I've been wearing a new necklace for nearly two weeks and haven't stopped to blog about it, and of course that just won't do! ... or you can wear it with just the simple silver side showing. Although I got both the charm and a necklace to wear it on, it would be fine to just wear the charm on any silver chain. I've observed that teaPOT jewelry is much more common than teaCUP jewelry, so I was particularly happy to find this little charm. And it was just $8.50, so it's the right price for gift-giving as well. Charming, eh?